Prepare yourself for two wild rides! "Earth's Wild Ride" is a fictional tale told by an elderly man to his granddaughter, who was born and raised on the moon. Discover the dynamism and elemental energy of Earth! Audiences are swept along roller coaster rides through lava-spewing volcanoes, white water rapids and many other powerful systems on our home planet. We even explore the violent Earth of the distant past. 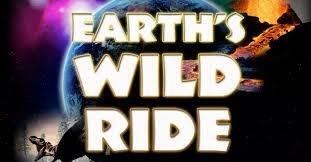 "The Great Planet Adventures/Earth's Wild Ride" double feature takes you on the ride of your life! "The Great Planet Adventures" sweeps you along to each major world in our solar system. Watch adventurous astronauts cliff diving on Miranda, riding monster trucks on the moon, jumping off asteroids, jet packing on Triton and skimming through the atmospheres of gas giant planets! an exciting solar system tour unlike any other!